The tropical island of Sri Lanka, once known as Ceylon, lies off the southern tip of India. 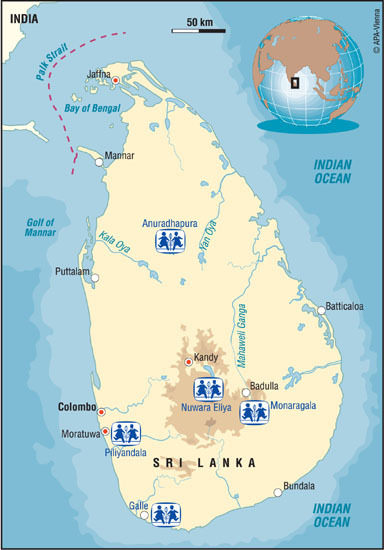 The ethnic conflict between the Sinhalese majority and the Tamil minority since the 1980s, has caused massive suffering. A peace agreement was reached in 2002 and this raised hopes for a lasting settlement. However, peace talks between the two sides broke down in 2003. Approximately 800,000 people, one-third of whom are children, have been displaced, sometimes several times. Of the 2.5 million people living in the areas directly affected by conflict, approximately one million are children under the age of 18. The charity's first community in Sri Lanka opened in 1982 on the outskirts of Piliyandala, about 12 miles south of the capital, Colombo. It has 16 family houses which are home to over 120 children. There is a kindergarten and an SOS Youth Village for adolescent boys and girls, where in various workshops they can learn trades and skills, as well as taking their first guided steps towards independence. The girls also learn how to make gold jewellery, which will form an essential part of their marriage dowry. Educational needs are met by the charity School where about 90 per cent of the 850 pupils come from the neighbourhood. The local community, particularly poorer families, also benefit from the SOS Social Centre which offers classes in cooking, sewing and English, and dental and medical treatment. Training of Sri Lanka's SOS mothers takes place at Piliyandala, and a house for retired SOS mothers has recently been constructed. The charity's second Sri Lankan community opened in 1984 at Nuwara Eliya in the central highlands, about 6000 feet above sea level. Nuwara Eliya is Sri Lanka?s most famous hill station and one of the island?s best known holiday resorts, with spectacular views of the hills and tea plantations. The village has 10 family houses, a kindergarten and an SOS Youth Village for boys, with training facilities similar to Piliyandala. An SOS Medical Centre and Clinic provides health care for local people and programmes to improve standards of nutrition, health and education. About 28 miles south of Nuwara Eliya, a hill farm at Malpotha trains SOS boys in organic farming, animal husbandry and conservation, giving them the opportunity to achieve real independence as farmers. SOS Children's third community opened in Galle in 1990 after enormous difficulties and delays due to the unrest in the country. Galle, a former Dutch fortress, is the largest city in the southern part of Sri Lanka and is an important tourist centre. The SOS Children's community, which is on the outskirts of the city, has 12 family houses built in pink natural stone, a kindergarten, a youth house for 24 boys, and an SOS Social Centre providing child day-care facilities and medical treatment for the local people. The charity's fourth Village in Sri Lanka opened in 1994 in the northern part of the island in the celebrated ancient city of Anuradhapura, founded in the fourth century BC and famous for its Buddhist shrines. There are 14 family houses, a kindergarten and a youth house. As well as a medical centre serving the needs of the local people, the social centre provides vocational training opportunities and food and accommodation for street children and disadvantaged young people in the neighbourhood. SOS Children Monaragala opened in 2000. In south east Sri Lanka, Monaragala has a temperate climate and agriculture is the main occupation. The charity Village is on the edge of the city, built on land donated by the government. The 12 family houses are all three-storey and have views over the mountains. Facilities include a community centre, a kindergarten, a social centre and a clinic. In 1995, SOS Children ran an emergency refugee camp in the north of the country for children and families affected by the civil war. In 2003 a permanent social centre was opened in Batticaloa on the east coast of Sri Lanka. Following the devastating Boxing Day tsunami in 2004, the Social Centre at Batticaloa played an important part of the extensive emergency relief programme carried out by SOS Children. SOS Children set up 10 Child Relief Centres and temporary schools along the southern and eastern coast of Sri Lanka, providing clean water, food, medical care and schooling for thousands of children. Young people from the SOS Children's Villages in Sri Lanka played an active role in the distribution of food and other essential services. As part of SOS Children’s Rehabilitation Programme on the east coast, 1143 families are receiving a start up grant to help them begin rebuilding their lives. We are providing 600 families with fishing nets and boats so they can start to make a living again and provide food for their communities. We are also helping families to rebuild their homes in 3 devastated villages on Sri Lanka’s east coast. Community centres will also be built with classrooms, medical posts and cyclone shelters, depending on the need in each location. A new SOS Children’s Village is also being built in Batticaloa to give a new home to children orphaned by the tsunami. SOS Children is also working with vulnerable families in their community to help prevent the children being left destitute, by helping to rebuild their homes, and giving support with nutrition and education and vocational skills.